A low saddle can cause low action. Low action can certainly cause buzzing. Apart from the overall action, a low saddle can cause buzzing all by itself. A too low saddle can buzz incessantly when you play and be supremely annoying. The string comes up out of the hole and is supported right off the saddle so that it flaps and buzzes wildly when it vibrates. A taller saddle would give good contact with the string, but would also raise the action. 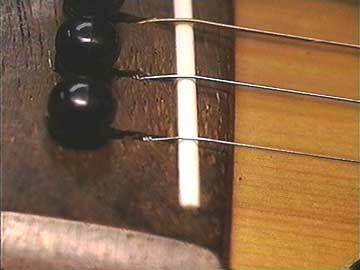 The simple cure for this condition is to make string ramps so the strings can press downward on the saddle to avoid buzzing and to get a good transfer of energy for good tone and volume. 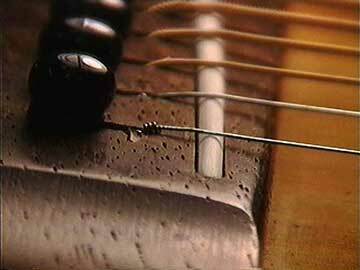 A good test for downward pressure is to try to lift the string off the saddle while it is tuned to pitch. If you can't do it, then you have good downward pressure. If it is easy to lift off, then you got trouble. String ramps will fix you right up!